Remember that time when you first read a manga or watched an anime? Remember how everything was so different and strange, and you finally realized that this was something special the Japanese were creating? I do too, but I also remember the first time I read Fushigi Yuugi. Yuu Watase is known by manga fans for her huge volume of shojo manga. Perhaps her fans have short attention spans though (not too much of a stretch, considering she writes for young girls), because the only way anyone could find Fushigi Yuugi interesting is if they only read the first five volumes and then fell asleep for the next eight. Actually, that's probably what most people will end up doing anyway, so forget I said it. Fushigi Yuugi, translated as "The Mysterious Play," follows Miaka Yuuki, a pretty typical middle school shojo heroine. She's a bit of a klutz, she doesn't get good grades or pay attention in class, and she eats a LOT. When she and her friend Yui discover an enchanted book in the library called "The Universe of the Four Gods," the two girls are sucked into the story's quasi-Ancient-Chinese world and become characters in the book. There Miaka meets the dashing young peasant Tamahome, and finds out that she is the Priestess of the nation of Hong-Nan, destined to resurrect the god "Suzaku." To do so, however, she must find all seven "Celestial Warriors" of Suzaku. And yes, they are all prettyboys. Unfortunately, things get ugly quickly when the sinister nation of Qu-Dong attempts to stop Miaka from summoning Suzaku. They want to summon their own god, Seiryu, using their newly-discovered priestess: Yui, who has turned against Miaka for unknown reasons. Now Miaka must find a way to win back Yui's trust and summon Suzaku so they can go back home to their normal life. "Part 1" (this review), contains volumes one through thirteen, and covers the main arc of the story. "Part 2" is essentially a sequel series that contains volume fourteen through eighteen. The funny part about my introduction paragraph is that Fushigi Yuugi was that anime/manga that got lots of people into the medium. The reasons why escapes me, since regardless of if it "created a genre" or anything, Fushigi feels bored and flat almost straight through. The early portion where Miaka searches out the seven Warriors is actually quite entertaining thanks to the quick introduction of interesting new characters and relationships, but once that freshness wears off around volume five, the series goes nowhere fast. The problem with Watase's writing is that she can't hold up a story for the full 13 volumes that the main arc of Fushigi Yuugi covers. Miaka and Tamahome, who become star struck lovers by the end of volume 2 (yes, volume 2), remain in the same gushing, romantic relationship for ten volumes. That is ten volumes without any significant relationship growth. This honestly feels like it could have ended at volume five or six. Instead, it falls victim to the classic shonen/shojo dilemma, in which relationships and situations are kept static in order to extend the length of the plot. Though they're often considered the most popular characters in the story, Miaka and Tamahome are anything but charming, since they are both so painfully idealized. It is, in fact, the supporting characters who add some life into Watase's story. Nuriko, a gay man living as a woman due to childhood circumstances, makes for one of the most interesting representations of gays in mainstream manga. While his friends joke about his cross-dressing escapades, they also refer to him as "she" and respect his choice of how he wants to live his life. Tasuki, a hot-blooded bandit, is a lot of fun, and Chichiri, a magical priest with a light-hearted disposition provides the always welcome Kenshin-Vash archetype. Even so, most of the supporting cast are flops, providing nothing but generic pawns to fill the roles of the seven Celestial Warriors. The ending is boring, generic, and unreasonable. When Miaka finally confronts Yui, who has caused her so much pain, the two get over their differences in a matter of moments, so that Watase can whisk us along to the "giant final battle for the fate of the world." Not only that, but the relationship between Miaka and Tamahome STILL goes nowhere by the end of the story. If there's one thing that helps Fushigi, it's the art. Watase has a thing for character designs, and I must say that they are far better than the typical big-eyed, wispy-haired shojo fare. Characters are often very animated, thanks to the use of large, expressive eyes and some really nice hair work. The designs (and fanservice) should appeal to readers of both genders. 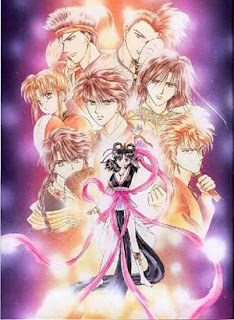 Many "old-school" shojo fans would assert that Fushigi Yuugi is something that all shojo, nay, all MANGA FANS should see. I agree, if only so manga fans can see how not to make a mature, interesting shojo. Take a cue from Miaka and shelve this magical book, because the last thing you want to do is get sucked into thirteen volumes of Fushigi Yuugi.